I’ve long had a fondness for sculpture made from found wood. 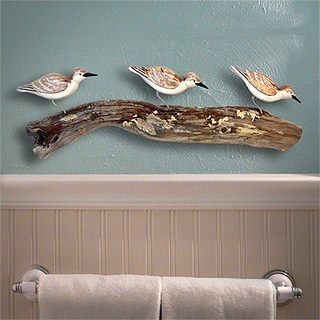 I guess this comes from my early childhood years when my mother would collect driftwood from the north west English coastline. When she found a good specimen, she crafted a figure or abstract shape out of the timber, which was often distressed in some form after floating in the sea for many months. The statue I remember most, which I still have, was a figure of Mary, Mother of Jesus. 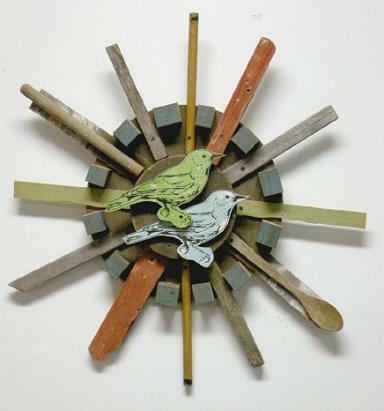 The above picture shows a wall sculpture by Dolan Geiman, a native of Virginia who now resides and works in Chicago. The piece is titled ‘Shenandoah Ship Wheel’ and is a collection of found wood that has then been painted with acrylics. As the name suggests, the sculpture takes the form of an old ship’s wheel one might expect to see on museum sailing ships. Most of Geiman’s work is sculptural in nature and takes its inspiration from his rural childhood. Throughout the years he has collected bits and pieces that attract his eye and many have been used in mixed media instillations that have been sold across the United States. You can read a lot more about this artist on his website which can be found here: Dolan Geiman. This wall sculpture is also available to buy although I believe it is a one-off so one might need to be quick. You can see purchasing information here: Shenandoah Ship Wheel.